THE 140-10-7N Portable Fitness Scale is an NTEP Certified Legal for Trade device that provides the highest possible accuracy when weight is a critical factor. In wrestling programs, weight-loss centers and even health clubs, weight can determine membership fees or classification levels. The Portable Fitness Scale is a 600 lb. capacity NTEP Certified Legal for Trade scale that provides the highest possible accuracy when weight is a critical factor. In wrestling programs, weight loss centers, and health clubs weight can determine membership fees or classification levels. For that reason, a legal-for-trade device must be used. This portable legal for trade device offers a full 600 pound capacity, making it the perfect tool for a broad range of weighing needs. The display can be mounted on a wall or placed on a desk for fast and convenient weighing. The platform is 14" x 14.5" x 3 inches high. The scale available from Central Carolina Scale only weighs about 20 lbs, so this base and indicator can easily be carried from event to event with ease. If it will be used as a portable item, be sure to add one of our transport carry cases to your order. Weight is displayed in both standard and metric values, accurate to within 0.1 lb. An onboard Body Mass Index (BMI) calculator helps save time and increase overall health awareness. 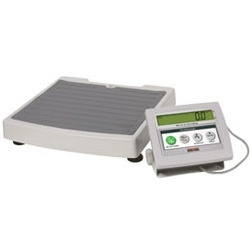 Operate the scale on the built in rechargeable battery up to 75 hours or plug in at any location. Platform: 14.5" x 14" x 3"
119551 140-10-7N 600 x 0.1 lb 14" x 14.5" x 3"